The entrance to the Gaya train station, near where the Buddha long ago made his way to the Bodhi Tree, has the same bleary, edge-of-the-world quality of most train stations in the middle of the night. I notice out of the corner of my eye backpackers with long European limbs stretched out on the hard black ground. Biharis look down with amazement at the unruly ease of videshis making themselves so at home among them. Fran, the English woman I know from the Buddhist Root Institute calls out to me. She is with two Frenchman I don’t know. The Frenchman are discussing Israeli-Palestinian politics in loud voices, as if they are in a café in Paris. I call back to Fran, but keep going. I am not in the mood for chatter about late trains to Calcutta, or overnight buses to Dhaka. There is a heaviness in my mouth that is not from something I ate or said or didn’t say. The solitude that boards the train with me bears down on me like a parent I don’t want to be traveling with in the first place. It complains, “Why a night train when you could have traveled by day? But here is where I am. Here and nowhere else. In my coach, half-asleep bodies are twitching in the upper and lower berths. I feel like a late arrival at a home where everyone has put in a full day, seen the sun rise and fall, and left the newcomer to deal with the empty darkness. The train to Calcutta clatters past silhouetted coconut trees, rice fields. I peer out at the landscape from my lower berth that makes me feel that I am riding in the bottom of a cupboard. It’s not always like this. Sometimes it’s comforting to settle into the black cocoon of a night train. The sweet sense of a locked-out world. The feeling of sinking into a hideout. I am carrying with me a book of poetry by Gary Snyder. If there were light, and I could read it, I would find comfort. Snyder would be remembering all the girls whose ears he pierced many years ago. When in despair, one is happy to drown in another man’s nostalgia. I feel myself wanting something external to blame, but Indian trains are normally the friendliest of places. Even when nothing seems friendly to me, that fact doesn’t escape me. My backpack, upright like a sentinel at the far end of the berth, seems to be watching me carefully. Does the traveler’s second body know more than we think? The night train as the perfect nest for infected solitude is well-documented. In his poem, Suddenly Adult, Jack Gilbert writes: The train’s stopping wakes me./ Weeds in the gully are white/ with the year’s first snow./ A lighted train goes/ slowly past absolutely empty./ Also going to Fukuoka./ I feel around in myself/ to see if I mind. Maybe/ I am lonely. It is hard/ to know. It could be/ hidden in familiarity. 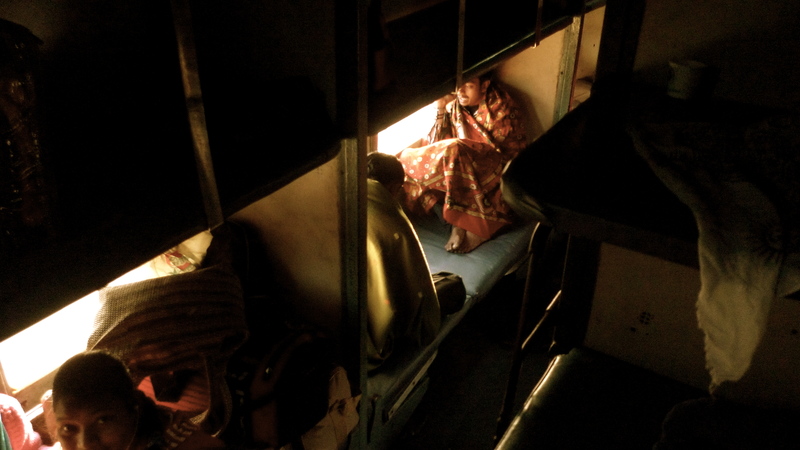 In the lower berth across from me an old Indian man, his back white as fresh paint in the darkness, groans in his sleep. A young man, possibly his grandson, touches him lightly, says something in Hindi. I search my mind for origins. This morning I was at peace under the Bodhi Tree, tonight I am at war with myself on a train. How do things like this happen? A good Buddhist would say, they happen because every mood is like windblown dust, always on its way out, always on its way back in. It is still too soon to begin peering out at the sky in search of a feather of light. Or begin listening for the footsteps of the tea wallah. Every hour is still the same as every other. I start to doze off when a rustling of activity rouses me. The old man is being helped to his feet by the young man and guided to the bathroom so gingerly they are like two men crossing an ice field. When they return, another young man appears, and the two work the small, stiff body onto its belly. It triggers a memory. My father’s cancer shrunken body in his red armchair in New York. It was also small and stiff. I was appalled by the vanishing of muscle, the sprouting of broad purple blotches on his arms and legs. Sometimes, when I got up the courage, I would gingerly touch him. He didn’t like being touched, which was a relief, because touching him was like touching death. I am struck by the young men’s devotion to the old man. The Indian way, I am told. A happily preserved remnant from antiquity. The first young man takes out a jar and pours some liquid into his palm. He begins rubbing it slowly into the dry ravine of the ancient back, which turns suddenly shiny. My darkness opens a bit to let in its briny smell. Robert Hirschfield is a New York-based writer whose travel stories appear regularly in Matador, India Abroad and other publications.